Thermal interface materials combine high performance acrylic adhesive with highly conductive ceramic particles for a reliable and high performance solution. These materials can be used as a variety of thermal management solutions including heat sink bonding, power transistor attachment and much more. Typically these applications require either automated or hand application and assembly. 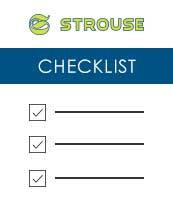 Strouse can custom design these materials into usable components that include a tab or extended liner. This prevents your employees from struggling trying to peel off liners, making them more efficient and accurate at their job. Strouse sources thermal materials from leading adhesive manufactures including 3M. To learn more about these materials read the Thermal Interface Materials Brochure. Strouse die cuts these materials to custom sizes, shapes, and formats. We can provide you products in the form of custom width rolls of tape or custom cut parts on a roll, on a sheet of material, or as individual pieces. If you have a question about a project you are working on or think using foil tape can bring your product to market faster, contact us today! Download our Checklist to Choosing an Adhesive Converter. This will help you understand the most important aspects when choosing a converter to partner with..